The chemo room is a large room with 30 hospital versions of La-Z Boys (envision a dentist chair that reclines and retracts) each with their own IV machine and a visitor chair. Studies have shown that folks heal better in community, so the room is open. Everyone can see each other. I’m sure I stared. I stared at the man to my left who was thin as a rail and aged by pain. I stared at the woman to my right whose skin was a hue that no human skin should be. But I wasn’t the only one staring. They stared at us, too. 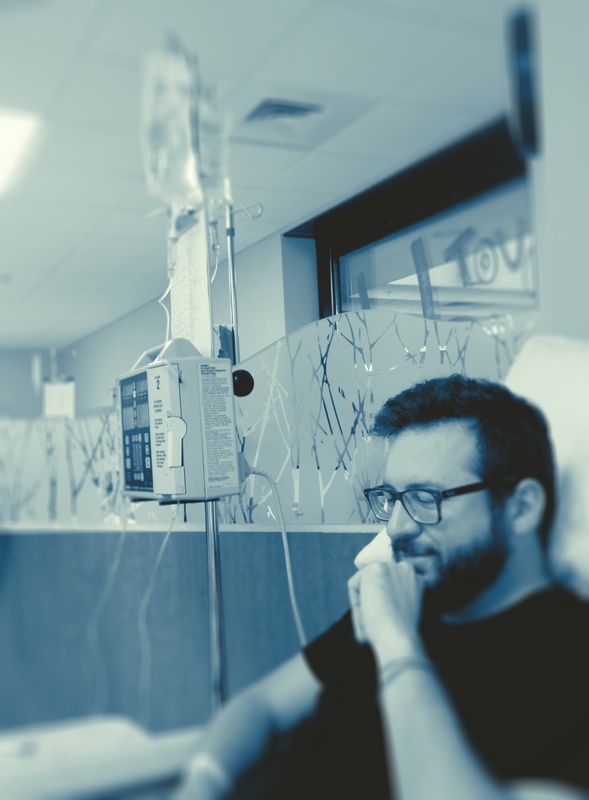 They stared at Adam’s full head of hair and lumberjack beard, they stared at how young we are, they stared as we cried when they administered the first bag of chemo. We all stared at each other. We talked a little, but it’s hard to make small talk when you know already the hardest thing about someone’s life just because you’re all in the same room together. We spent the next 8 hours watching bags of clear liquids drip into Adam’s body slowly, methodically, almost rhythmically. His IV machine makes a whirring, ticking noise that almost lulled me to calm, until I remembered that very machine was administering poison into my husband’s body. I spent the day staring at the poison they were infusing into his body with equal parts hatred and gratitude. Day 1 was long, scary, and perhaps not quite as terrible as I envisioned it might be. Day 1 is in the books, we have started the journey. Adam’s chemo will be administered in 3 week cycles. We thought we might feel better after day 1 after knowing what to expect. But to be honest, we still don’t know what to expect. We don’t know how Adam will feel today or tomorrow or next week or the following week. We don’t know how his body will respond to chemo, and we don’t know how the cancer will respond to chemo. And as we wait, we wait on the LORD, we continue to trust Him, we continue to believe that He can heal. I’ve been reflecting on this verse this morning, and praying it for Adam. Thank you friend. And I powered through that season with all the tissues and wine. Thank you friend. Glad to know we aren’t in this alone. Not. Grow. Weary. You will sure think you’re weary to the max, but by the Lord, you will have strength to keep walking. And you’re not doing it alone. Welcome to the ranks of the weary and worn doing dark times together – we keep on going. Love you, thanks for journeying with us! Kim, this is so sweet! Thank you so much. I’ve got your info, so great! Waiting with you…and praying. Sending you both love too. Thank you Anne. This is so good. Thank you so much Sarah! We’re so grateful for your love and prayers! Oh Allison, my heart cries for you both. I am praying, for healing, for strength, for peace in the midst. Allison & Adam – thanks for the courage to share this with others. Just know many many people wait alongside you across Nashville and I’m sure the country. Hold tight and hang on. We love you! Thanks Gini! Grateful for you and our awesome team! Thanks Manny! So appreciate the prayers and support. Adam, it’s Ginger from Hancock and CAA. I didn’t know about this, but I can tell you that you will certainly be in my prayers. May I put you on a prayer list at the church where I grew up in a little town of Sandoval, IL? Don’t know what to say at this time, but you are such an awesome person and I can tell you have a wonderful wife even though we never met. I will pray for Allison as well. You are so loved by many, and I am sure your name is in many prayers for healing. Thinking of you. Thank you so much Ginger! Of course you can put us on your prayer list, the more people praying, the better! Thank you for your kind words! I am lifting up you both in prayer. I pray for Adam’s healing and your strength. You are constantly in my thoughts and heart. Great reminder. Thanks so much, Joan! Praying for you both, and sending love and appreciation. As we head out the door to India, we are so thankful that no distance, nor time zone difference, can separate us from you, through prayer and the love of Jesus! We love you guys so much, and are thankful that His everlasting arms are carrying you!